One of the chief tasks of a college student is to write, and write, and then write some more. Professors will ask you to write not only in your English and Rhetoric classes, but also in courses required by your major. Writing isn’t just an academic exercise. It is a way to learn critical thinking and self expression. Both key skills in a digitally connected world that requires constant written communication in the form of email, text, social media posts, and web copy. Many of us believe that we are terrible writers, but the truth is writing in NOT a talent, it’s a skill. It’s something that anyone can master with proper instruction and practice. Why trial and error is the key to exploring careers. She discusses why it’s important to give yourself room to explore your major and career options when you’re first starting out. How you can’t escape writing. Writing is everywhere. It’s not just an academic exercise you’ll use in school. It’s in texts, social media posts, emails, web copy, and reporting for many professions. Why writing is not a talent. Writing is not innate, but self-expression is. Think of writing as just a medium for self-expression. How to create a writing process. She shares the importance of drafts and iteration in writing, and recommends some strategies for creating a writing process of your own. Strategies you can use to become a better writer. There are many forms of good writing. She shares how becoming a better writer is about experimenting, observing, and practicing this craft. 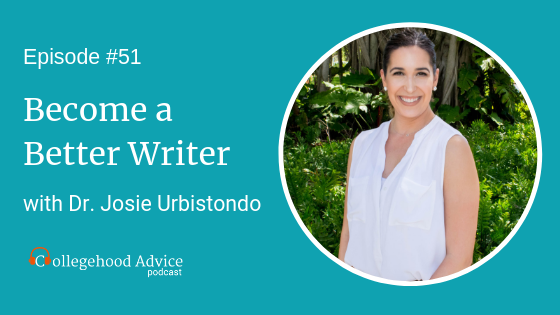 Dr. Josie Urbistondo earned her Ph.D. in English Literature at the University of Miami after receiving her M.A. from New York University and B.A. from Florida International University. Currently, she is faculty member at the University of Miami and CEO, Chief Essay Officer for Write Your Acceptance. WYA expertly guides students through the college application essay and supplements to maximize college acceptance. She works with undergraduate and graduate school applicants. For tips and techniques, sign up for WYA’s mailing list on their website - writeyouracceptance.com. Also, find them on IG and FB @writeyouracceptance.